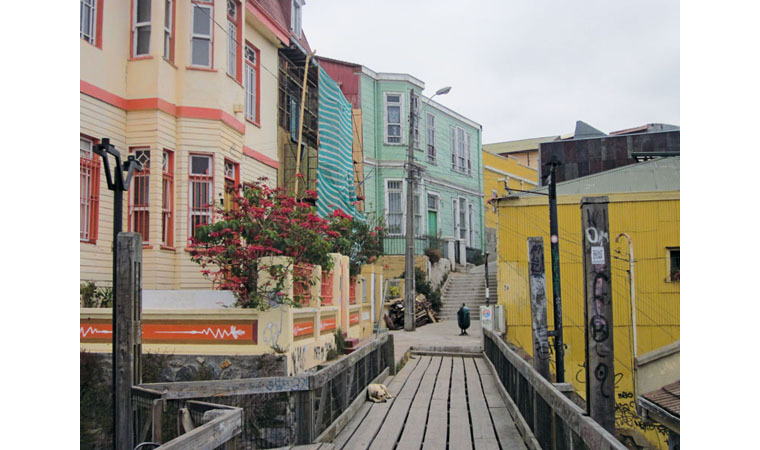 With its natural harbour, Valparaiso rapidly outgrew the narrow strip of land that borders the water and could only expand onto hills that jut out like thick fingers reaching to the sea. Hence, funicular lifts were built to gain access to the homes built above the original settlement. Painted old and buildings houses, in various states of ruin, dominate, are thrown together to take advantage of scarce land. 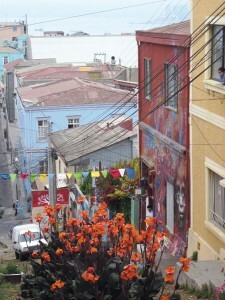 Valparaiso is covered with colourful wall art, much of it of high quality. This is what makes the city one of a kind. We arrived at 6am at Chile’s major port city, a 45-minute bus ride from the capital, Santiago. A friendly and helpful taxi driver took us to the area called Conception, an elevator ride up from the town centre. We decided on Hotel Patramonial, at the end of a cul-de-sac where there was once an elevator. It is a former mansion, with wooden floors and balustrades, our most luxurious hotel yet on this trip, complete with a turn-of-the-19th-century salon. The room in this four-star hotel was one of the best so far in our travels, at $120. We loved our barrio, full of charming, colourful restaurants and cafés, many hostels and friendly corner stores. There are gorgeous views of the town below with all its eccentricities and above on winding roads and alleys where we could have coffee and cake or just listen to one of the musical bands of youth serenading onlookers and selling their CDs. Walking around and taking the funiculars downtown and back again is fun. 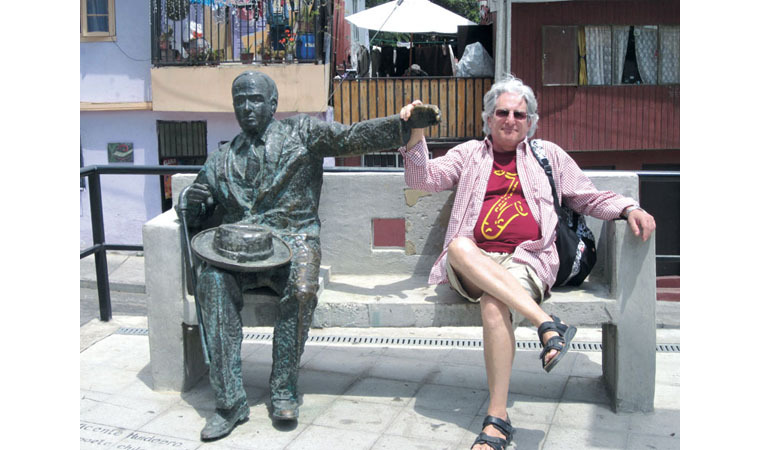 The highlight was a visit to one of Pablo Neruda’s homes, La Sebastiana, full of works of art and quirky furniture he had collected, among them a wooden horse from a carousel, which is in his living room. We had a recorded device to learn about his life through the various objects in his house as we climbed from floor to floor in this architectural poem, where he worked and entertained. He has a toilet in his bar, but this one is different: The door is latticed and one can see through the holes. Only the brave used it, says a sign. We have never enjoyed a tour more than this one. We could feel the poet’s soul in his rooms and art. The food in Valparaiso was superb, and we enjoyed the friendly, polite and warm people we met, including travellers. With its jumbled irregular architecture of every era, with art of every kind at every twist in the road or alley, this somewhat ragged but safe and charming city will remain in our hearts for a long time. 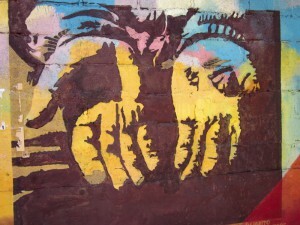 1 Comment on "Artsy Valparaiso, Chile: Up and down and up"
Been there and loved it. I try to make it out to Chile at least once a year. People are great and food is delicious!